Modern Machine Shop 89 ERP Software and ISO Certification | Precise Tooling Solutions Inc. | 812-378-8876 precisetooling.com | Roeders of America Inc. | 845-680-7020 roedersusa.com | Shoptec h Software Corp. | 800-525-2143 shoptech.com As for the broader industry, he sees no reason wh y other small- and mid-size machine shops could not find their own ErgoSmarts. Nor why other shops could not also layer a more busi- nesslike approach atop a legacy of machining expertise. In Mr. Dumoulin's view, there is a way forward for the "mom-and-pop shop," even if it seems uncomfortable at first. Don Dumoulin, CEO, shows off an example of the shop's new line of ergonomic workstations. He decided early in his tenure that investing back in the shop and diversifying made more sense than going on a "buying binge" of other machining operations. 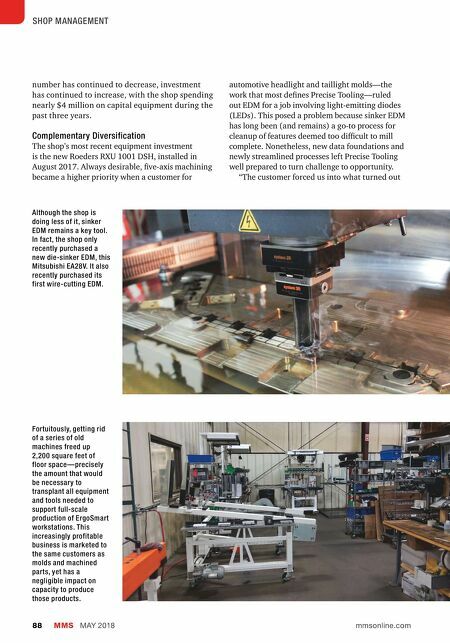 to be a very good thing," Mr. Dumoulin says about the need for a machine to rival EDM, adding that machinists are as impressed by the machine's speed as its precision. The resulting increase in capacity, particularly lights-out capacity for larger parts, has been critical to diversifying beyond the shop's core moldmaking work. Hailing from outside the manufacturing sector did not make Mr. Dumoulin immune to sticker shock. On the contrary, he says the need for sophisticated machine tools—not to mention complementary tooling and CAM soft- ware in this case—took getting used to. Still, the decision would have been far more difficult without first establishing the kind of operational visibility needed to justify, and to evaluate the potential impact of, such significant investments. Essentially, he says data-based decision-making helped provide not only the means, but also the courage to invest and adapt when work require- ments changed. Now, he is considering the addi- tion of a second five-axis machine. Precise Tooling's future investments may include more than just new machine tools. 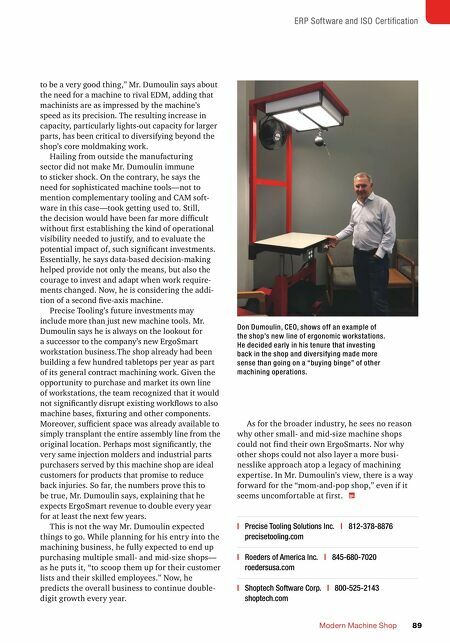 Mr. Dumoulin says he is always on the lookout for a successor to the company's new ErgoSmart workstation business.The shop already had been building a few hundred tabletops per year as part of its general contract machining work. Given the opportunity to purchase and market its own line of workstations, the team recognized that it would not significantly disrupt existing workflows to also machine bases, fixturing and other components. Moreover, sufficient space was already available to simply transplant the entire assembly line from the original location. Perhaps most significantly, the very same injection molders and industrial parts purchasers served by this machine shop are ideal customers for products that promise to reduce back injuries. So far, the numbers prove this to be true, Mr. Dumoulin says, explaining that he expects ErgoSmart revenue to double every year for at least the next few years. This is not the way Mr. Dumoulin expected things to go. While planning for his entry into the machining business, he fully expected to end up purchasing multiple small- and mid-size shops— as he puts it, "to scoop them up for their customer lists and their skilled employees." Now, he predicts the overall business to continue double- digit growth every year.